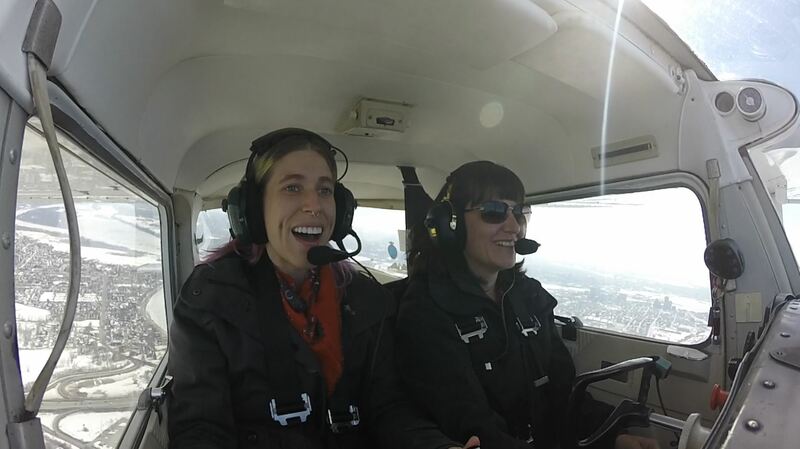 Not too long ago, it was the 2016 Woman in Aviation week (#WOAW16), a world-wide event where woman are invited to come forth and share their experience in aviation or experience flight in a light airplane for the first time, and more. Different events are taking place throughout the week. On March 12 I volunteered as a pilot, for the first time, to take girls up in the air to live their first experience of the joy of flying. Something I have been completely hooked on for more than three years. 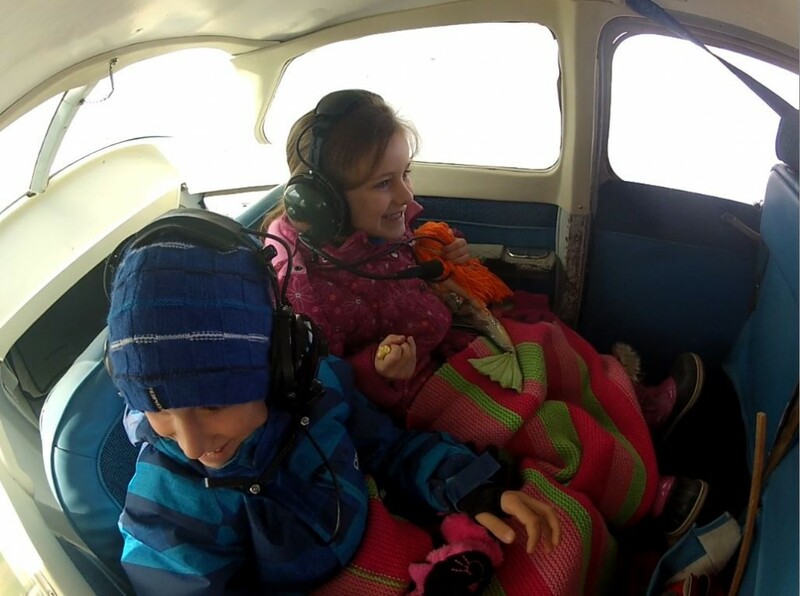 My children on their first flight in a light aircraft. I have volunteered in the past, on the ground as a boarder, for this same event (taking passenger from the museum to their aircraft), before I earned my private pilot licence and the excitement was invigorating. Living these emotions in the cockpit was so much better! The energy was awesome! The weather on Saturday was alright although a bit windy. But still, 184 girls and woman were flown up in the sky for free for their first ride in a light aircraft. 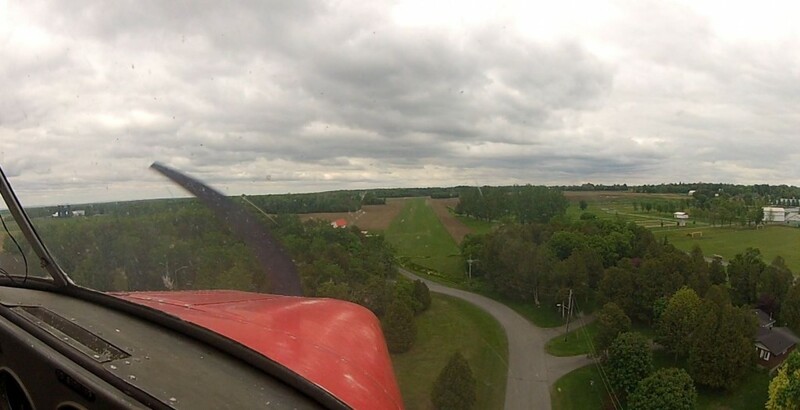 We embarked the passengers from the Canada Aviation Museum in Ottawa, at the Rockcliffe airport. Many other such days are organised. I invite all of you to look for one close to your home and participate next year. The climb up was a little bumpy, but I warned my passenger on the ground, and repeated once airborne that the airplane wouldn’t fall from the sky because it was rocking a bit. No one was sick under my watch! With the winds that day, runway 27 circuit was in use, my favorite of the two. We were able to pass over the Casino and see on our left the Museum of history and the Parliament. Here is the original Runway 27 Flyday circuit. A few days prior to the event, it got cut a little shorter, but still gives the idea. We didn’t go all the way up to Lake Pink, but turned north-east at highway 5. I had my GoPro camera setup facing us and it made great videos and screen captures. The expressions on their face tells it all! Flying is a passion I discovered sort of later in my life, compared to some who did in their teens. Some even had the chance of growing up in an aviation family where dad (or mom! or both!) were pilots or in another related trade. I had to work a hard path to make it through my PPL (like many others). A lof of the merit is attributed to one person in particular who generously took me up flying for free when I was struggling financially on the flying side of my life. He offered rides as it meant nothing to him, just happy to have company, when it meant the world to me to be airborne. Anytime he would offer me his free seat, I would happily scramble non-essential committments in my schedule to be able to hop in. When I was wrestling with flying schools and almost ready to hang my headset, he always had good words of encouragements. He even went the extra extra mile and became my instructor for which he had to obtain his qualification back. He believed in my capacity to become a licenced woman pilot. I will forever be grateful to him for enabling me to experience the great freedom of flight. Thank you Joe Scoles! General aviation unfortunately seems to be on a constant decline. Not as many people anymore are obtaining their pilot licence and then every year some are loosing their medical certificat, therefor their privilege to fly. It sure takes a combination of key factors to make it work but what if more people, year round, were able to go flying on empty seats, in airplanes, with pilots that will be flying anyway? After receiving so much help, I feel willingly compelled to give back. Or more accurately to share my love of flying with as many as possible. 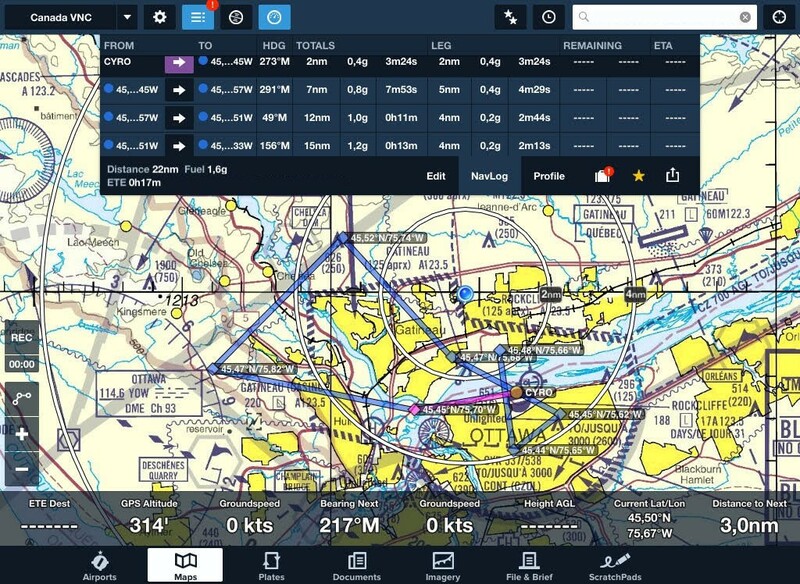 Lately I had the pleasure of taking as passengers people that never flew in light airplanes, used to fly a few years ago (or longer) and current experienced pilots. I learn from every one of these flights and enjoy every part of it. What if that flight could mean the same as when Joe first invited me in his airplane? They might be getting into a flight school and learn to fly. They might take back their headset, get current again, and be regular flyers visiting our many beautiful Canadian airports. And… they might want to give back too. This is a committment I’m happy to make. What about you? Je suis en effet passionné par l’aviation. J’adore ça! Merci pour ta visite et ton commentaire. Au plaisir de te relire. It is always a real pleasure to read about your passion for aviation. J’ai bien apprécié de lire sur votre expérience avec l’évènement « Les filles découvrent l’aviation » auquel vous avez participé à Rockliffe en tant que PIC ( Pilot In Command ) avec votre beau petit Cessna 150. 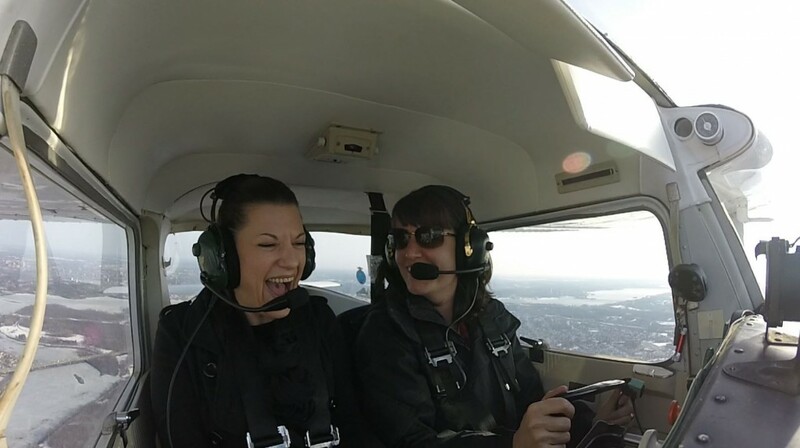 Vos passagères ont sûrement été agréablement surprises d’avoir comme pilote une jeune fille qui a son propre avion. Hey hey ! Je vous souhaite encore de bons vols pour 2016 ! Heureuse de te compter parmi mes fidèles lecteurs Pierre. Tes commentaires sont toujours bienvenus. Beau petit Cessna 150? Jeune fille? J’accepte les compliments. Merci, mais je ne crois plus entrer dans la catégorie « jeune fille » haha! Bons vols à toi aussi! Au plaisir!